Thousands of baby Chinook salmon have lost their lives to a faulty wiring mishap that cut off their water supply. Officials from the Department of Fish and Wildlife announced that the electrical issue caused a necessary pump to switch “off” and caused the flow of water to stop at the Thermalito hatchery. Initial estimates from the state on May 11 suggested that some 300,000 baby salmon had died, but on May 12, authorities revised that figure and announced that they believed only 72,000 fish had died during the incident. Electricians worked quickly to solve the issue and save the remaining 2 million fish, which had been rescued during the Oroville Dam spill in February. While initial estimates suggested a devastating 300,000 Chinook had been killed in the accident, officials say that after biologists had moved 1 million salmon from the holding pond, they were better able to assess the damage. Harry Morse, a spokesperson for the Department of Fish and Wildlife, explained that the total number of dead fish equated to a weight of 1,000 pounds, while there were about 10,000 pounds of live fish in the same pond. The Feather River Hatchery is essential to California’s commercial and recreational fishing endeavors, and provides the state’s Central Valley waterways with approximately 7 million salmon every year. But things are not all and well for the state’s salmon populations. A recent report from the University of California at Davis and the California Trout conservation group has suggested that wild Chinook salmon could disappear from the state’s waters within the next few decades. According to the research team, dams and current agricultural practices are some of the biggest threats to Chinook salmon populations. There are a total of 31 distinct species of salmon and trout that could be at risk, and at least 23 are expected to become extinct within the next 100 years. In 2008, similar estimates about the fate of California’s salmon and trout were made — but back then, the prediction for their future wasn’t quite so dismal. The 2009 report suggested that just five types of salmon would disappear from Californian waters within the next 50 years. But now, the five-decade outlook for salmon suggests that a heartbreaking 14 salmon species and subspecies will go extinct. Earlier this year, it was reported that millions of Pacific coast salmon were dying, and Californian authorities reported that salmon populations had dropped to record lows. 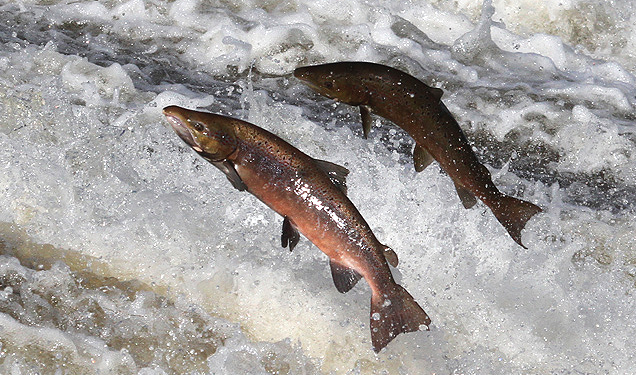 The future for Californian salmon species does not look very bright, and this latest “accident” is just another twist of the knife for these poor fish. Follow more news about California’s inept government at Collapsifornia.com.